For many years now we’ve all discussed how, when supplementing orally, the glutathione molecule on it’s own does not travel well through the stomach. The common knowledge is that it’s broken down during digestion and only a fraction reaches the blood stream. That brought about the rise of acetyl and liposomal gsh to take over as the standard for effective oral supplementation. A new study has just been released in the Journal of Agricultural and Food Chemistry that rethinks this issue. The news is fresh as this issue was published on October 1st 2014. Their team have conducted a study monitoring the GSH uptake using MALDI imaging or matrix-assisted laser desorption ionization. This allows them a visualization of the spatial distribution of the gsh molecule within a thin slice of tissue in two dimensions. They’ve combined that with Liquid chromatography with the mass spectrometry MALDI readings. Rather than paraphrase, I will quote the abstract of their study…. The current in vitro and ex vivo uptake study of GSH demonstrated that intact GSH can be transported across intestinal epithelial cells, suggesting that GSH uptake is not proton-dependent. It would appear that the initial uptake of GSH into cells is a rapid process. Furthermore, the visualized GSH after 60 min of transport by MALDI-MS imaging showed localization of intact GSH inside the intestinal wall. In vivo study found that ingested (13)C-GSH was rapidly converted to GSSG and accumulated in red blood cells and liver, but was little present in plasma. The ingested GSH has potent nutraceutical benefits for human health to improve oxidative stress and defense in human. Clearly these are meaningful results that throw into question some of the previous notions we’ve had on how gsh molecules transport through stomach lining. This could result in new developments and new supplements that absorb better and potentially provide greater health benefits. OR it means existing L-glutathione supplements may be more effective than we previously suspected! Either way it’s big news. First let me say, I’m glad they are doing this type of work and I can’t wait for more! I’m not over the moon, because we already have fantastic oral glutathione supplements in the form of acetyl-l-glutathione and liposomal, and precursors that we know can get the job done. What this study is showing us, is that in vitro and ex vivo the GSH passes the intestinal wall – so it CAN pass the intestinal wall in these conditions. It also then went on to the In Vivo portion, which is of course the one we care about as living human beings, and showed the ingested GSH rapidly became the oxidized GSSG form aka. glutathione disulfide. 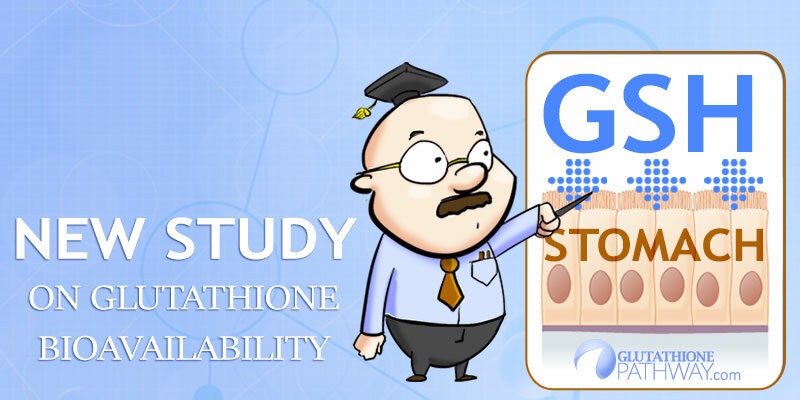 If you raise GSSG levels you are still relying on glutathione reductase enzymes to trigger a conversion back to usable reduced GSH for the antioxidant benefits. Awesome to see this study, but for now, will stick to what I know. I was first alerted to the study by naturalproductsinsider who’s posting is overwhelmingly positive.